Titanbet Online Casino is the United Kingdom-only version of the popular TitanBet platform. TitanBet as a whole has been around since 2009, but the UK domain only went live in September of 2014. It gives the site the feel of one that has been around for some time, but it still has the excitement (and great promotions) of a site that has just launched. The main online site is very active and growing. In addition, TitanBet realises that mobile is where the biggest growth is likely to be in the next few years. As such, the mobile-only site offers dozens of game choices and an easy-to navigate platform as well. Titanbet Online Casino has no discernible theme (or at least no clowns, pandas, or dragons other than in the slot games.) This is not necessarily a bad thing. A theme can be a good thing, but in many cases, it detracts from the overall enjoyment and appeal of a site. The colour scheme is simple and the site is inviting. The only main complaint you may have is that it is a bit cluttered and “wordy.” However, this is such a minor concern that it hardly bears mentioning. The huge selection of games at Titanbet Online Casino is one of the biggest draws of the site. This is very exciting for players who have played the same old, same old games time and time again. Non-slot players will appreciate the wide variety of games offered—providing more choices than your average “real life” casino! As far as slots go, the graphics may not be as realistic as they are on other sites, but there are a HUGE number of choice at TitanBet Casino. While there are not as many “real casino” slots as some sites offer, Playtech and TitanBet are beginning to offer more “casino-like” slots, including several that feature popular characters such as the Avengers, Spiderman, and Blade. In addition, the selection is growing rapidly, so you can expect even more to arrive as time goes by. The TitanBet App is brought to you under the umbrella carried by the entire franchise, hence giving you the TitanCasino mobile casino app. One of the greatest things about this is that the download provcess is straight forward and easy to follow. You can access this off any iPhone or Android device giving you mobile pleasure wherever you may find yourself. For residents or England, Ireland, Scotland or Wales it is good to know that you can now roam the UK at your leisure, taking your favourite mobile casino games with you on your travels. 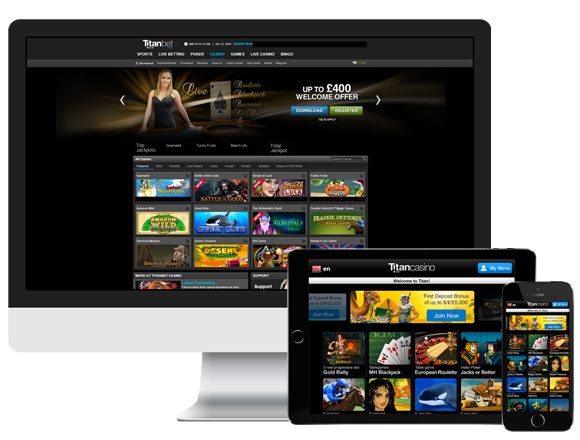 TitanBet uses Playtech software to power the gaming experience. As a table or non-slot gamer, this is exciting. Playtech games are smooth, clean, and work well. Slot players have mixed opinions about Playtech—many feeling that the graphics are not as vibrant as other types. The overall graphics package on the site is clean, if not remarkable. If you are looking to be dazzled by video and other elements—keep looking. On the other hand, if you are looking for a site that will fade into the background and allow you to play all your favourite games with few distractions, TitanBet is a great find! First, new users will appreciate a detailed FAQ that explains many of the issues that users are likely to encounter. This can be especially useful to players who are new to the idea of an online gaming site. After all, the basics are very important. However, Titanbet Online Casino does not expect users to work through their problems alone. In fact, they encourage communication from all players. The customer service and support on TitanBet is one of the best ANYWHERE – whether you are in London or Edinburgh. The site offers support by email, of course; however, you can also contact the support staff by telephone or online chat. With these options, you always have a connection with someone who can help you with any problem you may encounter. Titanbet’s UK site is a solid entry among the many options for online gambling in the United Kingdom. The site is relatively no-frills, but packs a powerful punch when it comes to its gaming options. I highly recommend it for those gamers who are tired of the goofy themes and endless hoopla that many sites utilise. This is an excellent place to go “get your game on” in a simple, easy-to-navigate environment. Slot lovers may find the Playtech slots are not as “realistic” as some of the other production companies’ slots are (without many of the real casino options). However, there are enough fun and exciting options (of both slots and other games) to keep gamers interested—and winning—today and for years to come! Definitely 5 out of 5 spades.